Sandy Feet Retreat, beautiful remodel Nov 2018, including full size washer and dryer! Enjoy the pool and boardwalk to the beach. As you enter the main living area you immediately are welcomed with high ceilings, hard surface floors with inviting area rugs, comfortable furniture and 4 HDTVs, you’ll know you’ve arrived in paradise as soon as you walk in the door. The interior of unit features a full gourmet kitchen which includes a refrigerator, microwave, dishwasher, cook-top and oven, coffee maker, Margarita Machine for all your frozen favorites! Circulon cookware an arrangement of cooking accessories that will make any chef smile. If you’re craving a Port Aransas beach accommodation with a bona fide front-line view to the ocean. Make your first order of the day to breathe in the fresh ocean breezes with a walk along the beach and fulfill the desire to dig those toes into warm white sand . . . for after all your front yard is the Texas Gulf Coast! 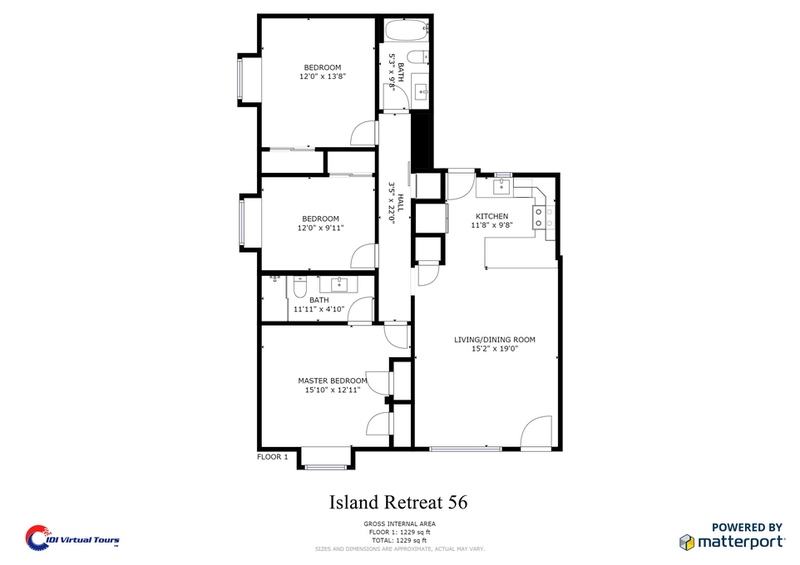 The interior layout of Sandy Feet Retreat was designed with an open layout and plenty of space to entertain. Enjoy the fully stocked kitchen with everything you need to cook your local catch of the day. The living space is spacious with plenty of seating. Enjoy the TV while relaxing after a fun day at the beach. Off the living room is an outdoor patio overlooking the beach and pool, where you can feel the wind, hear the surf, and smell the ocean breeze. The layout of the bedrooms is ideal for a family. Furnishings are tropical and warm. The master bedroom offers a plush king size bed with en suite bath. The second bedroom offers two full size beds and the third bedroom offers a queen size bed. The second full size bath is located down the hall from the guest bedrooms. There is also a new queen sleeper sofa for that family overflow. You'll find this vacation rental condo close to town for easy access to Port Aransas restaurants and shops where there's lots to do for young and old and everyone in between. Rent a golf cart and get to everything. We have a golf cart special that is first come first serve.